*Cut your hexagons accurately. Perfectly cut hexagons will help you achieve the precision required for this method. *Sew consistent 1/4" seam allowances. A 1/4" foot or patchwork foot is helpful. I'm able to place my needle 1/4" in by lining up the edge of the fabric with the edge of the presser foot. *You may want to reduce your stitch length to 2.0. Smaller stitches will help you hit your stop points more accurately. *Don't press until all hexagons are sewn. I know this seems counter intuitive, but I found that it's easier to sweep seams out of the way when they aren't pressed down. *Be sure not to backstitch into the seam allowance. Even one stitch will make a difference! It's better to stop a tish in front of the stitching line rather than stitch too far. 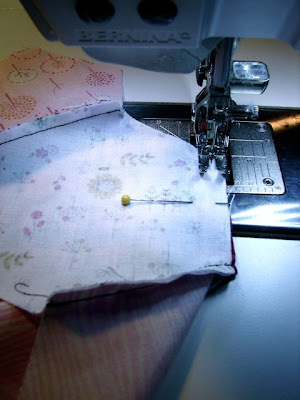 *The KEY TO THIS METHOD is your stitching lines. Instead of marking those 1/4" points, the stitching lines will tell you where to start and where to stop sewing. *This method works sewing individual hexagons onto a column or sewing two columns together. 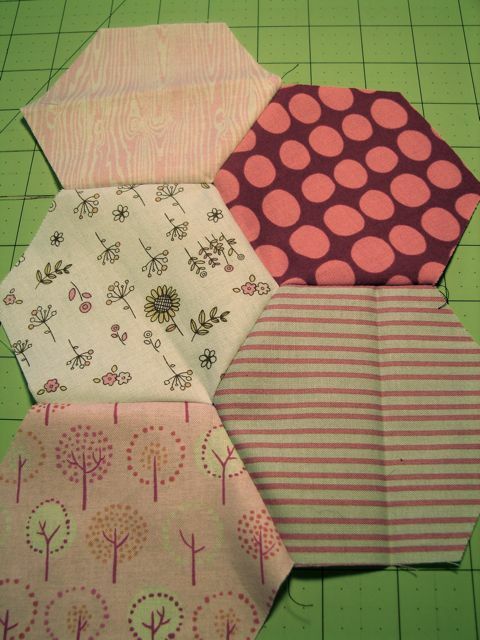 For the purpose of this tutorial, we'll sew one column and then add one hexagon at a time. *Relax...this really does work. It's going to feel odd at first, but you'll get the hang of it. Take a deep breath and grab some hexagons and let's get started. I used black thread for the purpose of this tutorial, but you'll want to use matching thread. 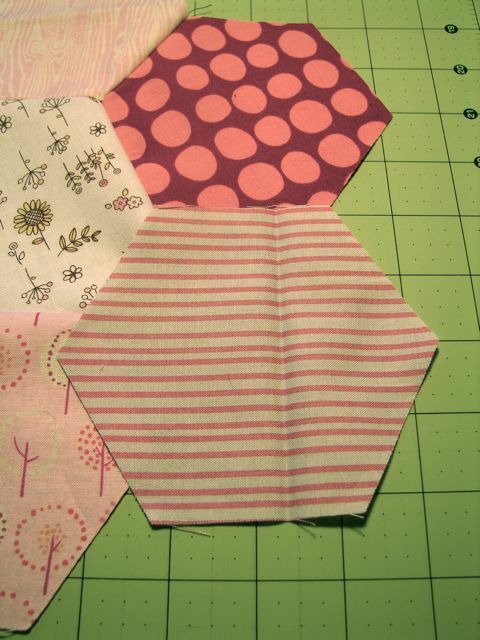 Start by sewing the hexagons together to make a column. Sew from edge to edge as shown and backstitch at each end. Don't press. Repeat and make your column as long as you'd like. 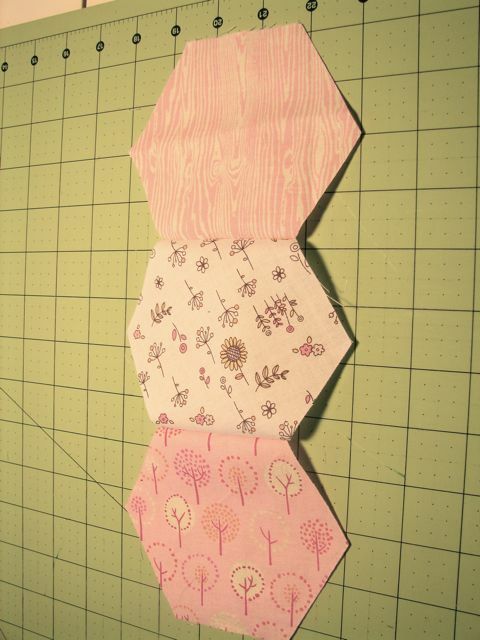 For the pink quilt above I sewed 10 hexagons together to make my columns. Place a hexagon in the second column as shown. 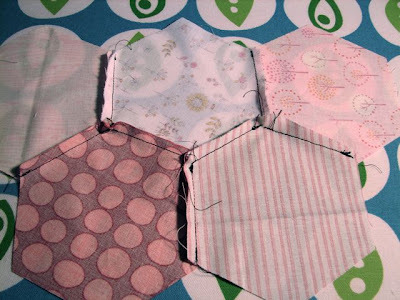 Place the hexagons right sides together along seam #1 lining up edges and ends of the hexagons. Notice how there is a stitching line on the left side and no stitching on the right. (If you don't see a stitching line flip the entire piece over!) 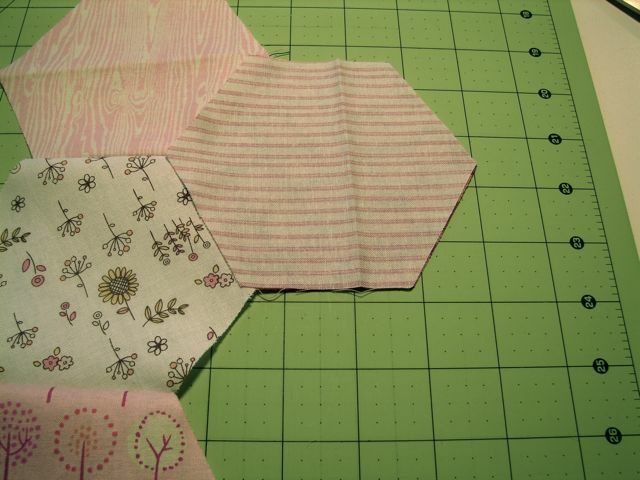 Make sure the seam on the left is swept away from the hexagon you are going to sew. Pin if desired. Position the hexagon under the presser foot. Drop the needle on the stitching line 1/4" from the edge. Notice how the presser foot is lined up with the edge which will automatically place the needle 1/4" in. I move the flywheel by hand to make sure the needle drops right on the stitching line. Sew from this point a couple of stitches, backstitch the SAME number of stitches. Continue sewing to the end and backstitch. You can sew to the end because there is no stitching line to stop you. Turn the hexagon right side up and the first seam is finished. Time for seam 2! Place the hexagons right sides together along seam #2 again lining up edges and ends of the hexagons. Sweep any seams away from the hexagon so that the two hexagons lay flat and are aligned. Pin if desired. Notice again that there is stitching on one side and no stitching on the other side. This time I decided to stitch from non stitching line side toward the stitching. Start sewing at the end, sew forward a few stitches, backstitch and continue sewing until you reach the stitching line on the other side. The stitching line means STOP! The picture below also shows how the seams and the other hexagon is swept out of the way. It is better to stop just in front of the stitching line rather than sew past it. Notice how I stopped just before I reached the stitching. Be sure to backstitch at this point. This is how your intersection should look when sewn. 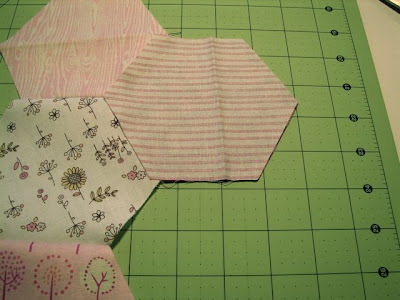 Place the next hexagon in sewing position in the second column. Place this hexagon right sides together on the one above. Notice in the picture below how no stitching lines are visible. Don't be fooled. There is a stitching line, but you need to flip the entire piece to see it. Flip the piece over. 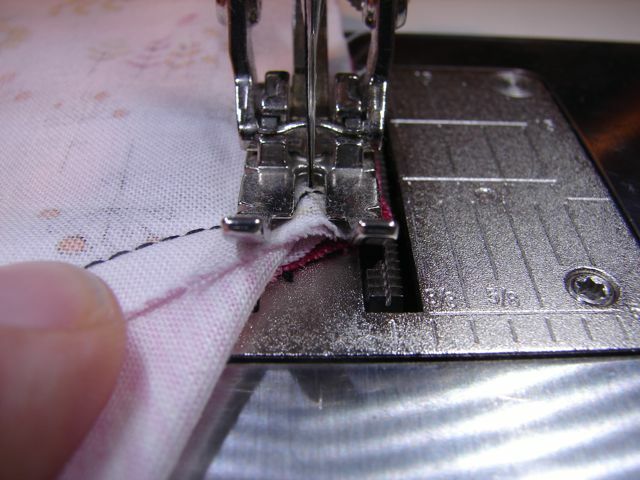 Feel for stitching lines...find them and make sure you can see them before you sew! There is the stitching line. Make sure your hexagons are aligned and pin if desired. 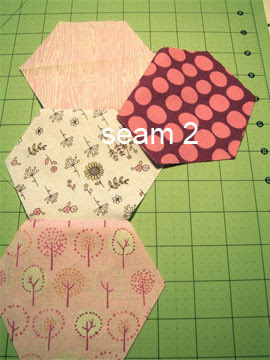 Make sure the seam is swept away from the hexagon you're sewing. Sew this seam just like Step 1. Drop your needle on the stitching line, sew forward, backstitch, continue sewing to the end and backstitch. Remember, you can sew all the way to the end because there is no stitching line to stop you. Step 5 Continue sewing adjacent seams. Flip the hexagon right side up. The next step is to sew the next adjacent seam. 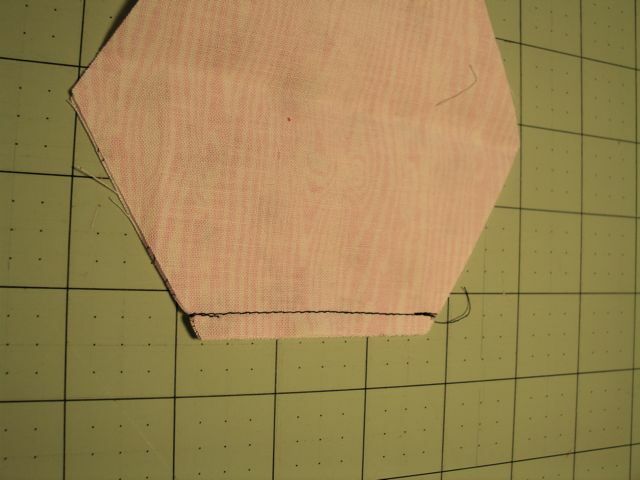 Place the hexagons right sides together along the seam making sure they are aligned. Sweep the seams away on both ends. Flip the entire piece over so that you can see the stitching lines. Notice this time that there are stitching lines on both sides. This means you have one START point and one STOP point. 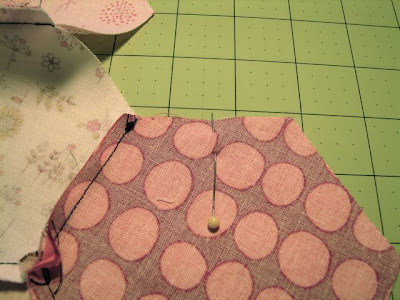 Sweep the seams on both sides AWAY from the hexagon you are sewing. 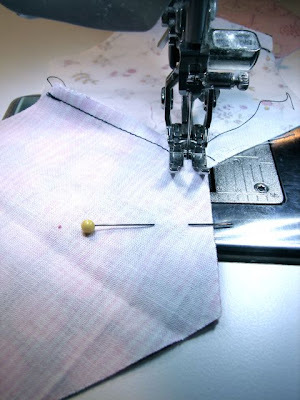 Drop your needle on the stitching line 1/4" in, sew a couple of stitches, backstitch, continue sewing and stop on or just before the stitching line. Backstitch. These are the most difficult seams to sew. Make sure your hexagons are aligned and lay flat. 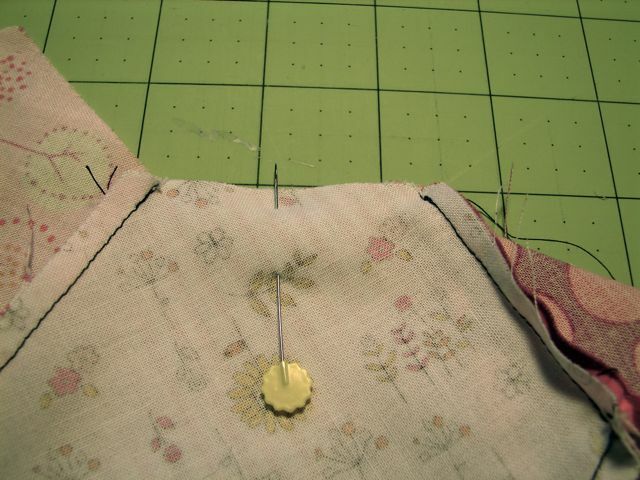 I pin these seams to make sure everything stays aligned before I sew. 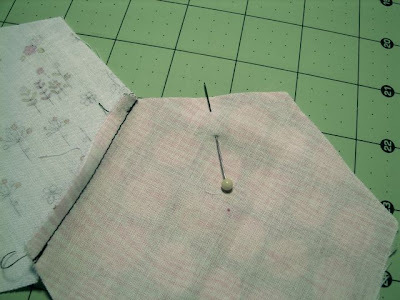 Continue sewing adjacent seams as shown above. Be sure to check for stitching lines. Repeat the process for each additional hexagon. When all the hexagons are sewn in, turn the piece right side down and finger press the seams into position. Trim threads at this point. Place the piece right side down and press. **Sweeping seams away from the hexagon you're sewing means sweep the seams and everything else too...in other words, any other hexagons need to be moved out of the way so that the two you are sewing lay flat and are aligned. You don't want to catch any other fabric in your seams. 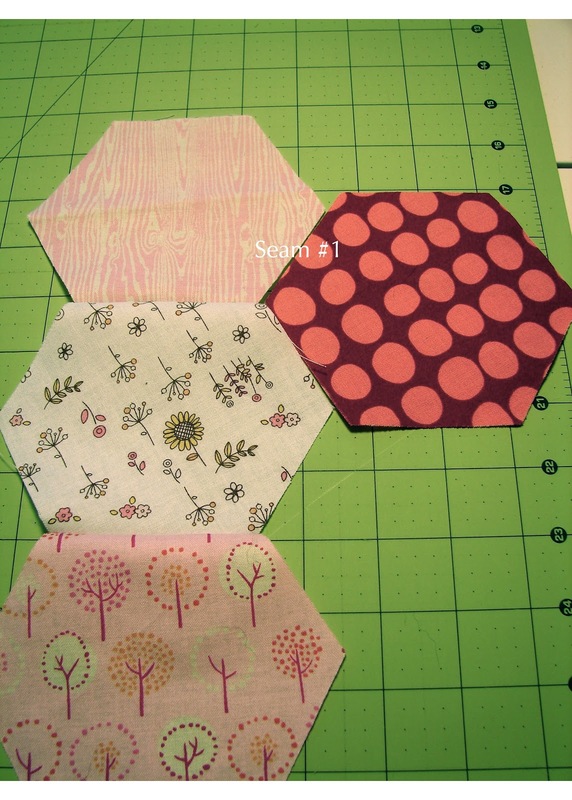 **This tutorial demonstrates sewing one hexagon at a time. This method also works with two columns of hexagons. Sew as many columns as desired. 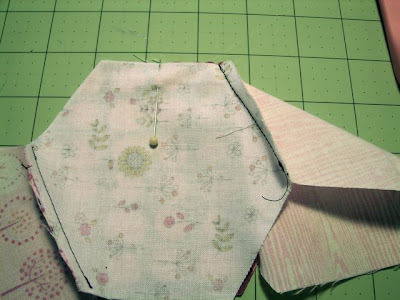 You'll sew one seam at a time just like above except most of the seam will have a stitching line stop and start point and you'll have a floppy column of hexagons to keep out of the way. I recommend you practice one at a time and when you feel comfortable with that, go for the column. Many thanks to blogless Elaine for sharing this method with me! You're the best, my friend. If you have questions, please ask in the comments or drop me an email. I'll do my best to help. After reading this a few times over, it seems that with some extra attention to accuracy and some extra patience, I could do this. Thank you for posting this tutorial. Hi. Thank you for the tutorial. What kind of stitch do you use to quilt with the zig-zag lines? i've tried to set my machine onto a large zigzag stitch but I don't get the curved effect that I see in this hexagon quilt. Thank you for the information-I love your work! thanks so much! 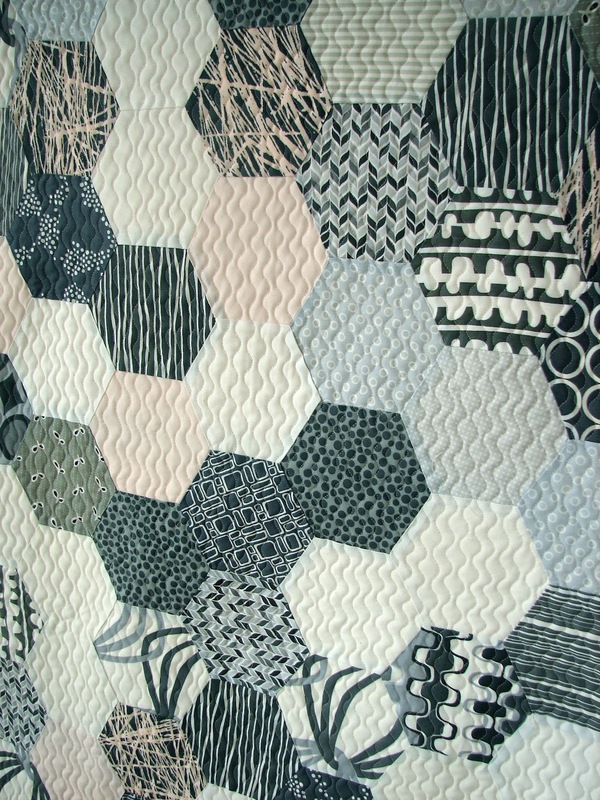 I've saved this and will add a hexagon quilt to my growing list of quilts to make. Oh, you've made sewing hexagons by machine look so very easy! Thanks so much for the tutorial. After doing them by hand I thought I'd never do any more again, but think with this method, I'll try again! Thank you for this excellent tutorial. I have not been able to get into the EPP hexagons but this is something that I am going to try. This is a much more appealing technique for hexies than sewing them by hand! I even might try a hexie design now. Thanks for sharing this! Thanks for that great tutorial! I always wanted to saw a quilt made from hexagons but didn't want to do the hand-piecing. This method looks really manageable! Jacquie, you make it look so easy! I might just have to give it a try. Thanks for the tutorial. 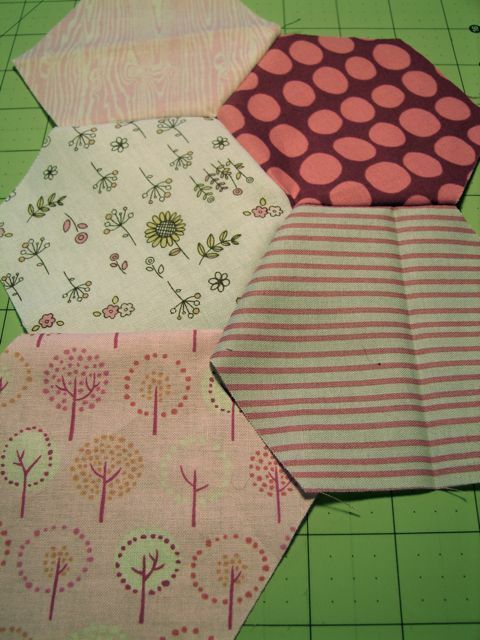 Now I want to set aside my other projects and make hexagons! Thanks for the tutorial - it looks like fun. Totally awesome tutorial! Thanks for all the time you put into it. Olá,sou uma viciada em hexágonos,tenho 13 colchas prontas,esperando só ter 20 para mandar para acabamento.Tenho de vários tamanhos e cores e padrões.Só trabalho com sucatas,então variedade de tecidos não falta.Comecei fazendo os pequenos e fui aumentando de acordo com tamanho dos retalhos.Estou juntando para a última?? ?...cerca de 20 centímetros.Por tanto amei seu t,obrigado por dividir conosco.Beijos e Bençãos. I am really looking forward to trying this -- the technique looks like genius! Thank you for such great detailed directions. I've been waiting for this! It looks easy, thanks for sharing! I'm going to try it this weekend. Thank you for this tutorial. I will definitely be trying this as I have an accuquilt fabric cutter and a hexagon dye that I've been intimidated to use. Didn't know if I should hand piece or machine piece and this just gave me the guts to try the machine piecing. Thanks! Thanks so much Jacquie! 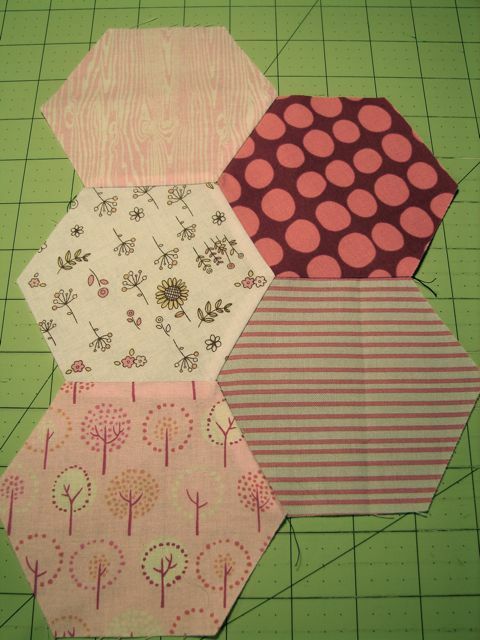 I've been wanting to try machine piecing hexagons, but didn't want to mark first. I'll definitely be giving this a go with the two column method. Great information. Can you tell me an easy way to accurately cut hexagons? Thanks so much for this tutorial. I saw a tiled batroom floor that was all hexagons awhile ago. It inspired a design that I sketched but had no idea how to construct. This has solved the mystery! Can't wait to try it. OMGoodness! It WORKS. I played today with some hexes and it WORKS! Thank you! Your turorial make it looks so easy... I will give it a try. Thanks so much for sharing!! Yay!! Thank you, thank you! I've tried this and I love it! I did have a problem with my seam allowances but by the time I'd finished I figured it out. Thanks again for sharing! Fianlly a tutorial for assembling larger hexagons by machine without cutting them in the middle! Yeah, thank you Jacquie! thanks for taking the time to post this, Jacquie. i'm looking forward to trying out this technique. it looks like a fun new technique to master. i love the larger scale hexagons. your tutorial was very nicely done!! Hello, Jacquie. Thanks for such a patient and thorough tutorial. It had all the cautionary suggestions a good teacher offers to keep her students from running shrieking from the room. I have not dabbled in hexagons at all but I am going to give this a try. I appreciate the time you spent to write this up. So timely for me! I was just given a pack of charms that have been turned into hexies and wondered how in the world to turn them into something wonderful! Thank you very much! I just tried this last night with small hexies and it worked great! Thank you! I saw this when you posted this, and I'm trying it today! Thank you! Are the seams pressed in any certain direction? Thanks for the instructions. I made all rows, then joined them. This is great. It took me awhile to figure it all out. My mother-in-law gave me some die-cut hexies she bought years ago and told me to "do whatever you want with them". I've been reluctant to do anything with them because I really didn't want to sew all those pieces by hand. Now with your tutorial I may just get something made with all those little hexies. Thanks a bunch!!! a very good tute! thanx for the new method; i'll be sure to use it on my next hexie project. Awesome! I got to give this a try. OMG, you are a lifesaver. I just cut all of my hexes this weekend for 2 quilts I'm making and my brain engaged tonight when I started stitching my chains together. Fortunately, I didn't get far when I thought to look for something that explains how to do this without marking 2,244 corners! You rock! Nice tutorial; must try it. Thanks for sharing. As always when I wander away something always points me back! You are my expert in all quilting areas! I hope this works for me! Thanks! Thank you for sharing this. It's getting a little bit easier with practice. I love any method where I don't have to mark or pin. Thank you! I am now machine piecing my teeny tiny hexies that were pieces from diamonds cut from 1" strips - they are making such cute tumbling blocks. Brilliant as usual!! I have been dreading sewing together a hexie stack i have because of this. Now i don't have to!!! TY Jacquie! Great tutorial and detailed instructions. Thank you! Thanks Jacqueline for the tutorial. It is a lifesaver for me - well it's helping me finish some UFO's. Love your tutorial. Hope you don't mind I blogged about it and shared the link. Thank you so much for your tutorial. You make it look so easy. I have been sewing mine by hand and it is taking forever. I can't wait to give your method a try. Thank you so very much for this tutorial. I love hexies, but don't always have the time to hand sew them and this method is going to make using all the hexies I have made into a super item. 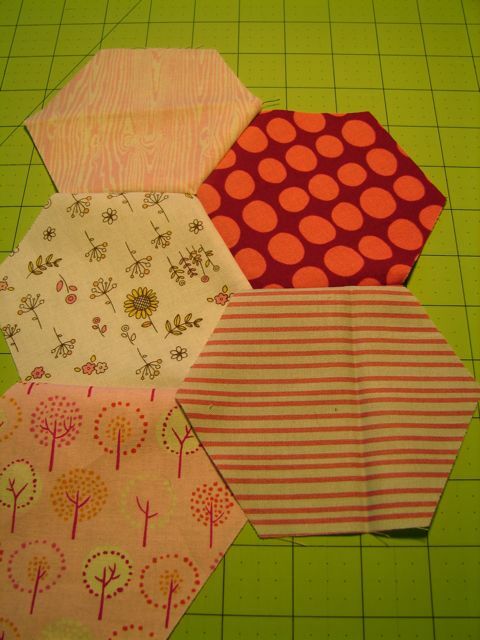 I have a cute little table mat pattern, made with hexagons. I happened upon this tutorial, and at first thought, "I don't know...". 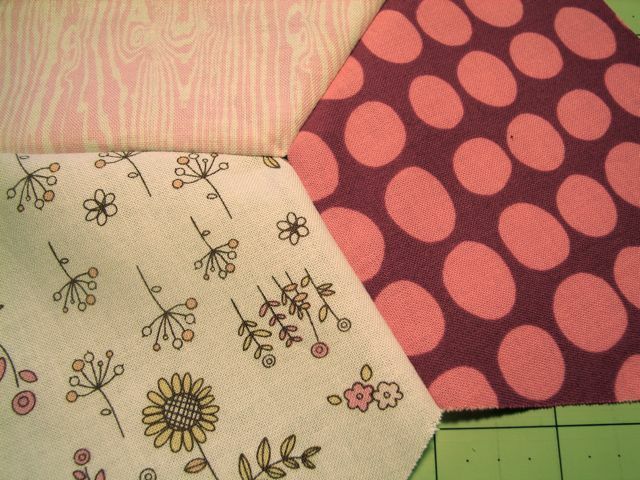 So I sat down at my machine, hexies in tow, and away I went. My 1st try didn't work, seam ripper to the rescue. My 2nd try...it worked, and It worked great! Now I am wondering if this technique would work on those exasperating set-in Y seams on the Lone Star block? Hmmm... May need to check it out. Thank you so much for this tut!